Join us on a very special bonus episode of Second Servings! Recently, we had the very good fortune of learning about an iconic food store in New York City. We interviewed Christine Sahadi Whelan, a direct descendant of Abraham Sahadi, who opened his grocery business in lower Manhattan over one hundred years ago! We talked with Christine about the history and future of this iconic store, now located on Atlantic Avenue in Brooklyn, including their recent James Beard "American Classic Award", celebrating their store's enduring commitment to high quality food and the strength of local communities. You won't want to miss this! The Bonus Episode Series from The Feast! Welcome to the October 2017 edition of our bonus series! For this month's extra episode, we're continuing our discussion of Middle Eastern foodways in past and present New York City. On this episode of Second Servings, we're delighted to bring you an exclusive interview with Christine Sahadi Whelan, managing director of Sahadi's in New York City. Opened in the 1890s, Sahadi's has been an institution in providing high-quality Mediterranean and Middle Eastern food for over one hundred years! Abraham Sahadi, a recent arrival to New York from Lebanon, opened his grocery store in lower Manhattan in 1898. 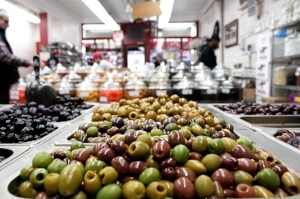 Located in what was called the "Syrian Colony", Sahadi's specialized in providing quality Middle Eastern and Mediterranean ingredients to its customers, like olives, bread, nuts, and cheese. 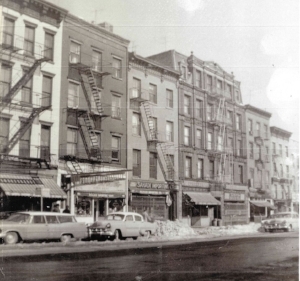 In the 1940s, a branch of the store opened on Atlantic Avenue in Brooklyn, an area that soon became synonymous with the Syrian and Lebanese communities of New York. Sahadi's has been open on that spot ever since, providing fresh, quality ingredients to New Yorkers. Sahadi's in 1958 on Atlantic Avenue in Brooklyn, NYC. In 2017, Sahadi's was honored as an "American Classic" by the James Beard Foundation, a testament to its commitment to quality food that reflects the character of its community. Today, Sahadi's is still a family business! Direct descendants of Abraham Sahadi, Christine and her brother, Ron, are the current managing directors of the store. The store still stocks many of the items that would have been found at the original store of 1898 including bread, cheeses, spices, and more! We explored the origins of Sahadi's store as part of our recent episode: From Washington Street to Atlantic Avenue: Food Stories from New York's Little Syria. Haven't listened to it yet? Find it here! Have you subscribed to The Feast? Make sure you're subscribed to The Feast so you never miss an episode. It doesn't matter if it's on Apple Podcasts, ACast, Stitcher, or Player.Fm, they all have our new and old episodes. No reason to miss an episode! Make sure you're subscribed so you get every new episode fresh from the oven!